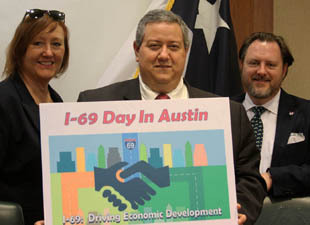 The Alliance for I-69 Texas had a successful I-69 Day in Austin on March 1st, combining a morning workshop on leveraging I-69 for economic development with a day of visits with members of the Legislature. Themes for the day were the importance of I-69 as a freight corridor and a driver for potential economic development. Among the speakers were Marc Williams, deputy executive director of the Texas Department of Transportation, and State Senator Juan “Chuy” Hinojosa of McAllen. 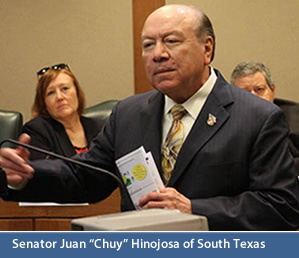 Senator Hinojosa thanked members of the Alliance for their years of persistence in successfully pushing I-69 forward toward full reality. 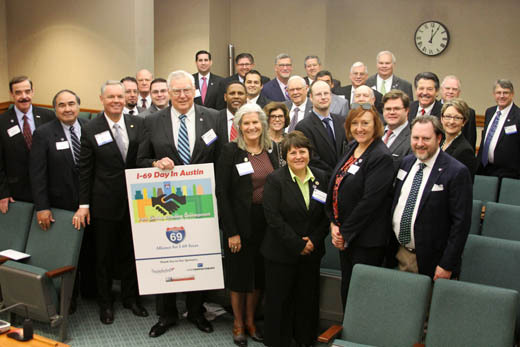 During the afternoon, Alliance representatives called on members of the Texas House and Senate and their staffers to remind them of the importance of continuing to build out I-69. Thirteen of the 31 Senators and 53 of the 150 House Members represent counties that include a segment of the I-69 System in Texas. More than one-third of the population of Texas lives in the counties along the I-69 route. The Alliance message to lawmakers was that the highways that make up Future I-69 are already major freight corridors. With freight traffic on Texas highways projected to double by 2040, completion of I-69 is essential to safe, efficient movement of goods. 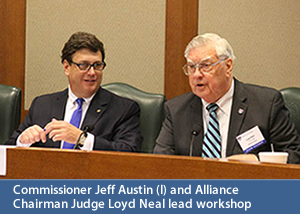 The Alliance members voiced strong support for full appropriation of highway funding promised Texas voters who approved Proposition 1 in 2014 and Proposition 7 in 2015. They stressed that continuing upgrades on the I-69 System are also important to providing evacuation capacity for the growing population along the Texas Coast. Texas Transportation Commission member Jeff Austin led a panel that discussed economic development lessons learned in the three states at the northern end of the I-69 national route – Michigan, Indiana and Kentucky. A total of 579 miles of Interstate 69 now exists in those states. Held in the busy State Capitol building, the workshop included panelists Lee Lingo, president of Kentucky’s Hopkins County Regional Chamber of Commerce; Janice Karcher, vice president for economic development, Flint & Genesee Chamber of Commerce in Michigan; and Michael Thissen of the Center for Applied Research and Economic Development, Outreach and Engagement at the University of Southern Indiana. 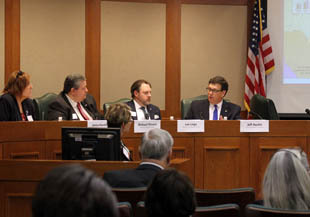 A second panel discussed Texas strategies, tools and successes in leveraging infrastructure for economic development. 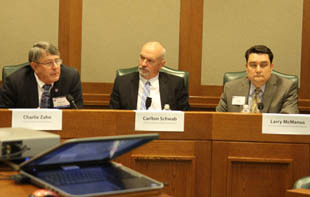 Charlie Zahn, commission chairman for the Port of Corpus Christi Authority, led a panel including Carlton Schwab, president and CEO of the Texas Economic Development Council, and Larry McManus, manager of the Community Relations Division within the Business Assistance Department in the Economic Development and Tourism Division of the Office of the Governor of Texas. 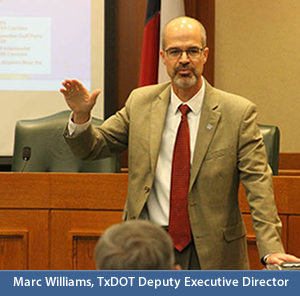 Commissioner Austin praised the work done by the Alliance for I-69 and the I-69 Advisory Committee in helping TxDOT identify and prioritize projects to be advanced to planning, engineering and finally into construction. “I-69 is about economic development but it is also about wealth creation,” Austin said, pointing out that the Transportation Commission has been concentrating on work done by the Texas A&M Transportation Institute to establish return on investment metrics for individual highway upgrade projects. The tool looks at economic savings through quantifiable factors like congestion relief and accident prevention. During his trip to Texas, Lee Lingo took a two-day tour of port facilities at Houston, Victoria, Corpus Christi and Laredo. “Your ports are important to us in Kentucky. 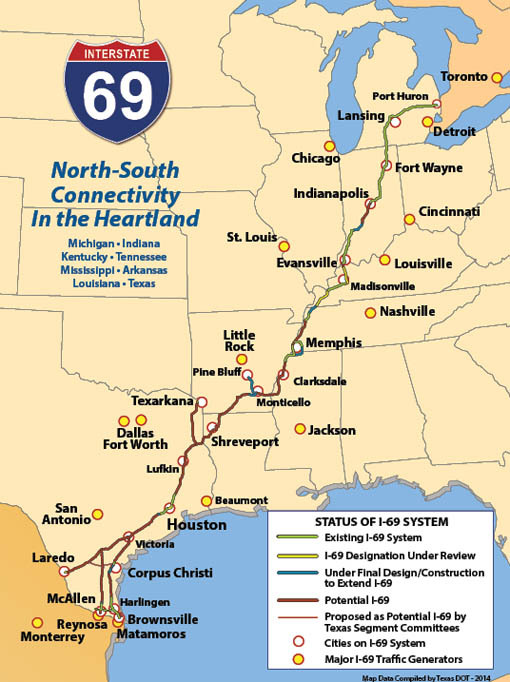 We know what trade is on this corridor and I-69 will be important to moving that trade,” he said, noting that I-69 can ultimately be the fastest route connecting points along the way from the border in South Texas to the border in Michigan. Indiana’s Michael Thissen stressed the importance of building coalitions in the process of leveraging infrastructure for economic development. 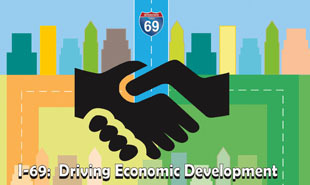 Indiana has formed the I-69 Innovation Corridor which has set up task forces, identified economic development champions and moved forward with marketing initiatives. Janice Karcher provided background on the region around the important I-69 border crossing into Ontario at Port Huron, pointing to the kind of economic development opportunities that exist in the mature economy of that region. Marketing for the area puts an emphasis on the low cost of living, moderate wage levels, educational facilities and transportation infrastructure. Charlie Zahn pointed to the $40 billion in new industrial plants and associated infrastructure now being invested in the area surrounding the Port of Corpus Christi. Keys to this development are reliable and relatively inexpensive natural gas supplies, deepwater port transportation, pipelines, highways and a mature rail system. Carlton Schwab observed that the I-69 routes through South Texas to Houston and on through East Texas pass through the “haves and have-nots of Texas.” While there are dynamic industrial port cities on the coast and at Laredo, the region north of Houston has not experienced the same kind of growth. He said I-69 provides real opportunities for communities in East Texas to build successful industrial parks and other attractive facilities using the local economic sales tax tool. Larry McManus pointed out that economic development in Texas is really done at the local level. For new locations or expansions of existing operations, the state’s economic development agencies rely on local partners to be the key players in helping companies make investment decisions. Alliance delegation ready to make the rounds at the Texas Capitol.